One of the fastest growing schools in India, with 80 schools and more than 80,000 students. The school houses award- winning faculties and strives to provide the highest level of education to students in India today. The use of technology in teaching is emphasized greatly in all its schools and it has won accolades in being the ‘Best Technology enabled’ schools in all of India. To further grow its footprint in ‘digital education’, they partnered with KITABOO®, which has over 14 years of experience in creating interactive eBooks for publishers, institutions and corporates. Converting textbooks to rich interactive digital textbook for iPad, Android and PC/Mac, KITABOO® will add contextual enrichments and make the subject mater come alive for students, which will help in retention and comprehension. The books will be enriched with high-resolution images, adding audio and video notes by teachers/authors on specific portions, which would help in a distraction-free learning experience for the student. 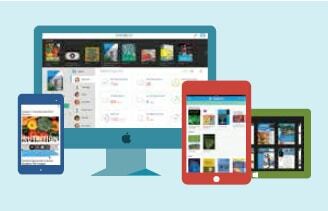 KITABOO® Widgets will allow addition of quizzes, flashcards, and drag-drop activities into the textbook itself. With KITABOO®’s strong analytical engine embedded behind the reader, it will have the capability to analyze and record the student movement on the book, page-bypage. The teacher will now know how much the student has read, how much time has been spent on each page and what activities have been performed on the page. KITABOO® utilizes both content encryption as well as license key validation mechanisms to validate an authentic user. The eBook content is encrypted / password protected with secure keys. The DRM encrypts audios, videos and images using AES 128-bit algorithm with CBC mode with PKCS5 padding. When an end user requests for an eBook, KITABOO® validates the license for that book. The package can only be decrypted by KITABOO® cloud reader or native reader apps. Finally, the Digital Textbook Platform would enable better engagement among students, owing to more compelling content such as audios, videos and assessments. Teachers on the other hand would be able to better gauge a student’s performance and engagement with better usage analytics. KITABOO® Cloud, a GOLD winner of the prestigious Brandon Hall Award for Advance in Mobile Learning, has processed and converted over 10 million input pages, it is an end-to-end eBook solution, that provides a great way to digitize books, make them interactive and distribute and deliver efficiently to your readers. And best of all, almost no major upfront investments are needed.